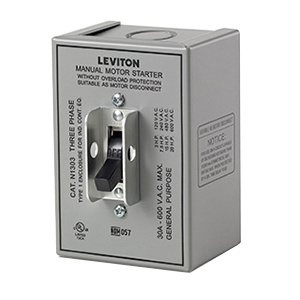 Leviton Type 1 AC manual motor starting toggle switch has positive contact design that enhances fast making and slow breaking. The industrial grade switch has silver alloy contacts for maximum conductivity and service life. This switch has back and side wire terminals that accept up to #10-AWG solid copper wire. While using stranded #8-AWG wire remove terminal clamp and use ring terminal. It has a current rating of 30-Amps. It is grounded to enclosure. The switch is suitable for manual ON/OFF switching control of conveyor systems, pumping machines, HVAC systems, air compressors and other heavy manufacturing equipment. The toggle switch meets UL 60947-4-1, Supersedes UL 508, cUL per CSA C22.2 No. 111: File #E63969, NOM-ANCE, ANSI C-73, NEMA WD-1 and WD-6 standards.